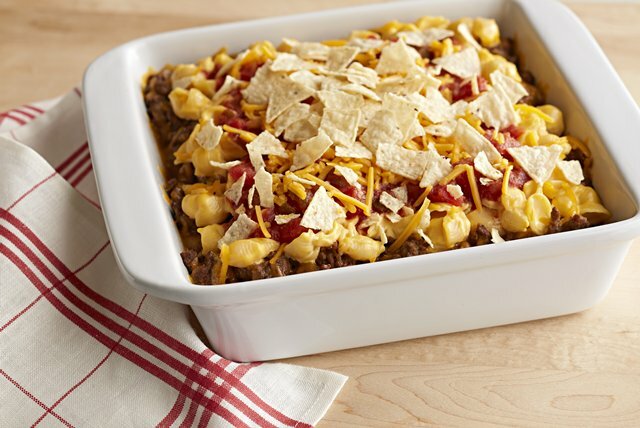 This VELVEETA Nacho Bake is hearty with salsa, sour cream and ground beef—all covered with a topping of cheesy crushed tortilla chips. Stir sour cream into prepared Dinner. Spoon half the Dinner mixture into 8-inch square baking dish; top with layers of meat mixture, half the cheddar and remaining Dinner mixture. Cover. Bake 15 min. Top with salsa, remaining cheddar and crushed chips; bake, uncovered, 5 min. Save 80 calories and 13g of fat, including 5g of sat fat, per serving by preparing with VELVEETA Shells & Cheese Dinner Made With 2% Milk, extra-lean ground beef, BREAKSTONE'S Reduced Fat or KNUDSEN Light Sour Cream, KRAFT 2% Milk Shredded Cheddar Cheese and baked tortilla chips.